Within three days a meteorite will destroy the earth. A convicted child murderer will use them to take revenge. One man will use them to protect his family at all costs. I personally cherish a vast fascination for apocalyptic-themed Sci-Fi & horror movies and have seen a truckload of titles in this style, but I can honestly state I have never seen anything quite like Javier Guttiérez‘ Before The Fall (aka Tres Días). It’s one of the most emotionally unsettling, uniquely structured, unpretentiously honest and hauntingly beautiful movies I’ve ever seen in my life. Before The Fall isn’t just a movie about an all-devastating meteorite; this is a movie about choices, personal sacrifices, unconditional devotion, persistence and even a tiny sparkle of hope. The vast majority of “the-end-is-near” movies deal with trying to find a method to prevent the apocalypse from happening and/or focus on a small group of people as they are preparing a new beginning for after the complete destruction. 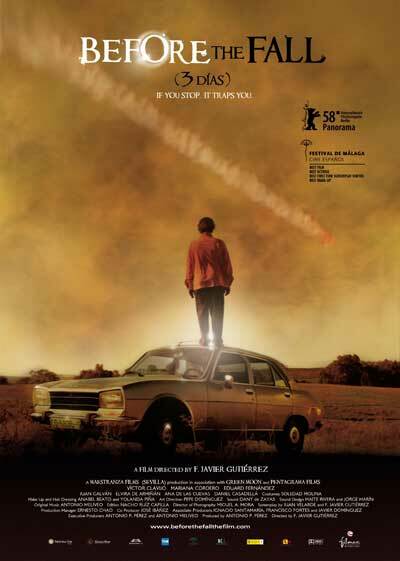 Guttierez‘ film – deeply impressive for a long feature debut – makes it pretty clear and irrefutable that there isn’t any chance left of avoiding or surviving the Armageddon. The faith has been determined and everyone’s doomed, but this magnificent parable handles about how to spend those precious last numbered days. This concept is utmost simplistic and straightforward but actually I haven’t seen it in any other movie ever before, so even that Before The Fall is similar to a whole list of movies, it constantly feels original and courageous. The governments of all nations in the world one morning announce that a large meteorite will inevitably collide with earth in three days. They knew it longer already, but waited with the announcement in order to avoid anarchy, mass-hysteria and chaos as much as possible. That quickly turns out a wise decision, as anarchy, mass-hysteria and chaos are the only things ensuing after the announcement. The plot follows Ale, a small town carpenter who still lives with his mother and is generally regarded as a lazy and non-ambitious lowlife. Ale always lived in the shadows of his older brother Thomas, who became an immortal hero after helping to capture a notorious child murderer 15 years ago. Thomas is now successful, married and the father of four children. Immediately after the announcement of the upcoming apocalypse, riots in prison cause all criminals to escape, including the child murderer. Ale’s mother is convinced the killer wants revenge against Thomas, but since he and his wife are abroad, she begs Ale to accompany her and protect the children. Ale is reluctant to spend existence’s final three days babysitting, but gradually changes his mind as he notices the threat of the child killer is for real and because his nieces and nephews are still unaware of the imminent apocalypse. Before the Fall unfolds as a tragic drama, then converts into a highly exciting action-thriller and then eventually converts back into a tragic drama. Throughout the entire middle section, when Ale is trying to safeguard the children from a potential serial killer, the suspense and ambiance are so intense that you almost forget the Armageddon is approaching. Ale fights a battle to protect the kids and survive himself as well… only to die all together a couple of days later. As a viewer you constantly know this, but still you support and hope for Ale and the kids to remain alive as long as possible and even longer. Before the Fall is an enchanting, beautiful and thought-provoking movie with stupendous acting performances, chilling music and breath-taking filming locations. Careful sensitive viewers, as the movie also contains a handful of confronting bits of harsh violence, graphic bloodshed and nihilistic carnage. Easily the most overwhelming and dazzlingly brilliant movie I’ve seen in the past years; nothing short of a masterpiece.